This entry was posted on August 28, 2011 at 2:26 pm and is filed under History, Literature with tags Bow, Burdett Road, Franz Muller, Hackney, Kate Colquhoun, London and Blackwall Railway, Mr Brigg's Hat, North London Railway, Thomas Briggs. You can follow any responses to this entry through the RSS 2.0 feed. You can leave a response, or trackback from your own site. In yet another example of the strange overlaps between this blog and my own interests and experiences, I used to live, coincidentally, in a modern block of flats partly built on land reclaimed from the old North London Railway, just north of the old site of Bow station. It is possible that Thomas Briggs was first attacked within thirty metres of the site of my old apartment. Bow station has indeed gone, but Bow Church station on the Docklands Light Railway lies immediately on the other side of Bow Road today. I used to walk past the site daily on my way to and from work. The building of the old Bow Road overground line station still exists, converted into a betting shop, in the shadow of the bridge over Bow Road, which still exists today. The old Bow station was by all accounts a much larger building than the two surviving stations in the Bow area, and it even incorporated a concert hall which was used not just for musical performances, but also educational and political meetings. The huge efforts made by philanthropists to educate the East End poor in this era should not go unmentioned, as they led to the establishment of the People’s Palace in Mile End, which later became part of Queen Mary College. I’ll remember to look out for the “Top O’ The Morning” the next time I go for a stroll in the eastern part of Victoria Park. The size of Bow station surprised me when I first saw old photographs of it a few years ago. It seems a very large structure, particularly if you know the site today. Some of the site is covered today by a secondary school, and by a college in the building that once was the Poplar Town Hall (which was located in Bow, rather than the area I would call Poplar). The route I usually walked along to get to Queen Mary took me through Tower Hamlet Cemetery, but before reaching that I had to pass under the railway line leading to and from Bow. 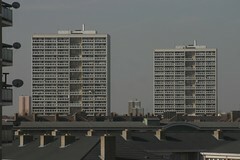 That flat in the tower block must have had an excellent view. Council-built apartments met sensible standards in terms of size, something that unfortunately does not apply to privately-built flats of the past two decades. While it may be a luxury to have two bathrooms in a a very well-presented private apartment, there is no luxury in tripping over boxes or piles of books, as I have discovered since living in London. The satellite images on Google Maps and Bing appear to show a single railway track on the line from Limehouse, past Tower Hamlets Cemetery and over Bow Road. I’m not aware of passenger services on this line: it may be used for freight or moving trains between other lines. Google Maps is wrong about the railway lines in Bow. It shows the Docklands Light Railway travelling north-northwest from Bow Church station and continuing parallel to Fairfield Road and up towards Hackney Wick. In reality, the DLR line turns eastwards north of Bow Church station and runs parallel with the main rail line to Stratford. The map needs correcting. I remember thinking several years ago that building over the line running from Bow to Hackney Wick removed the possibility of reopening old railway lines for future local transport needs. This loss of old, disused railway lines is an issue that affects many British cities, and makes the possibility of developing local light transport networks more difficult in the future. It applies in many places – including Cardiff. The railway Bridge at Burdett Road is still in use – it was fairly recently rebuilt, in fact. Trains run by C2C operate from Fenchurch Street along the old route described in the post, alongside the DLR, through Limehouse Station (which was called Stepney in the old days, by the way) and then it swerves north, on across Burdett Road and up towards Bromley-by-Bow along the route past Tower Hamlets cemetery. It no longer stops at Bromley-by-Bow, however; the next stop after Limehouse is West Ham, whence it carries on into darkest Essex. This is in fact the route followed by the old London Tilbury and Southend Railway. Come to think of it, I travelled along this route myself years ago when I gave a public lecture in Southend Library, of all places; I was worried I might get thrown out for talking in the library. I decided to go via Fenchurch Street out of curiosity, because I’d never used that station before. I had no idea that it went so close to where I used to live because it was dark during the journey and I couldn’t see where I was. Yes. I’ve just looked at the modern A to Z map and that shows modern railways that are actually in use (unlike Google Maps). That does include the route from Limehouse past Tower Hamlets Cemetery and on through Bromley-by-Bow. It also includes the section across Bow Road up to the main railway line from Liverpool Street to Stratford that I mentioned earlier. The Wikipedia article about the old Bow Road station claims that section of track across Bow Road today is “used only for emergency diversions and stock moves”. 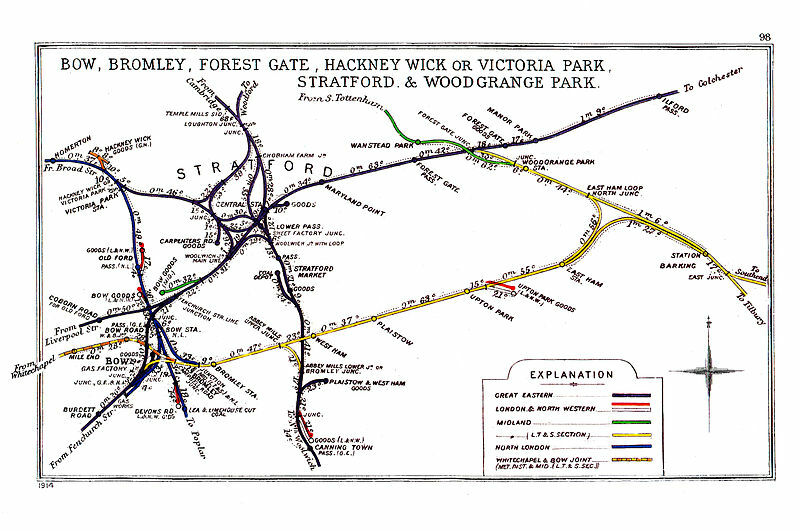 So it seems that nowadays the only way to get from Fenchurch St to Hackney Wick would be via Stratford….unless we’re playing Mornington Crescent! There are traces of old railway lines all over London (and elsewhere). If you walk up Lisson Grove from Marylebone station to Lords cricket ground you go over a bump in the road that was a bridge over an old goods line; detour below and you can see where it is boarded up. Not all of the defunct lines were for carrying people; this one carried coal. And Lords had its own underground station, which explains why it is so far from the tube stations of St Johns Wood (to the north) or Baker Street (south). Marylebone station itself was intended to be extended west, but the land was bought by someone else which is why you have to walk down some platforms to get to others. Beeching gets a bad press for closing down many train lines, but in rural areas there was a logic to it as it became normal for families to own cars and the railways were built before the car. Whether it was right judged from the future, who knows? Yes, there’s a host of disused “ghost” stations on the underground system, many of them still pretty much intact below ground but sealed at Street level. See, e.g. I was on a district line train from Whitechapel which lost power at a point that was coincidentally right next to the old St Mary’s station. It was quite spooky. In fact the expansion of the underground put paid to many of the local overland railway services. For instance, the reason why the station at Burdett Road fell into disuse was the presence of the much more popular underground station at Mile End. Another thing that should be mentioned about the Victorian railways is that the incredible expansion that had taken place by 1850 had its downside. Many of London’s poor were simply evicted from their (rented) homes which were then demolished to make way for the tracks and stations. I’ve looked closely at the walls of the tunnel while travelling between St Johns Wood and Baker Street but could see no traces of the boarding-up of the platforms of the old Lords station. What I don’t know is where its street entrance/exit was (can anyone help?) I know that the lines themselves run under the banqueting suite immediately inside the precincts of the ground along the Wellington Road. If Muller didn’t do it (or at least, commit robbery with violence, if not actual murder), how did he come by Mr. Briggs’ hat and watch and chain, do you think? And whose hat was found in the carriage, if not Muller’s? Matthews’ ? Were the two men in the carriage with the victim Muller and Matthews (the cabman), or the two bank clerks who alerted the station staff at Hackney Wick to the blood in the carriage (and who also worked at the same bank as Mr. Briggs)? I would be interested to know your thoughts.